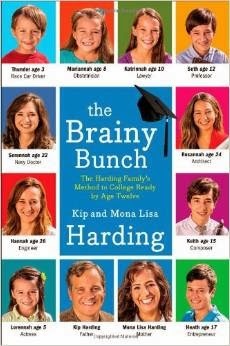 Behold & Reflect: Review of "The Brainy Bunch"
Review of "The Brainy Bunch"
After seeing some of the Harding kids on a video online, Joe purchased the Kindle version of their book, The Brainy Bunch: The Harding Family Method to College Ready by Twelve. Written by Kip and Mona Lisa Harding and many of their ten children, the book chronicles Lisa's experience homeschooling her enormous brood at an accelerated pace, while intermittently taking on part-time jobs to help pay the bills and put her husband through college, grad school and a PhD program. The bulk of the book seems to be written by Mona Lisa, with an occasional sidebar by Kip and several essays from the kids-- possibly meant to showcase their college-readiness but mainly showing that the kids believed their home school method to be a positive experience. While Mona Lisa does write at length about how she juggled so many different children and how she kept a close watch over her tweens as they attended college, she is a little bit vague on her actual teaching methods. I guess this is because she did rely heavily on home school materials and educational websites to do a lot of the teaching. As someone who is not really planning to home school, I still found some good inspiration from this book. The Hardings emphasize helping a child find his or her passion and really running with it. They tailor the child's lessons for an actual career of the child's choosing. They see each of their children as individuals and promote each family member as their resident expert in something. Home schooling's biggest benefit, in my mind, is that students are not bound to study "core" material that would obscure their passion for a particular subject or bog down the process of honing their natural abilities. In addition, teaching key skills in a way that links them to the child's dream job seems like a great way to motivate them to work hard and see the importance of learning. The emphasis on teaching children to learn on their own was another highlight. Lisa admitted she never did science experiments because the materials seemed too costly and potentially dangerous, but she is a big fan of responding to her kids' curiosity by telling them to "Google it and come back and tell me the answer." Probably when ten children are asking questions, this is the most efficient way to satisfy their curiosity without going crazy finding all the answers yourself. But I also think that teaching children to search out their own answers is important. I would also add that children should be taught how to discern whether an online source is credible. Daily reading and journaling also struck me as the antithesis to the glut of busywork that I remember from my public school education. To be lifelong learners, children need to love reading. Helping them find quality literature and nonfiction from a young age can kindle that love. As a journalist, I also think that as children get older, it would be incorporate current events into that daily diet by encouraging children to read news stories about their areas of interest. Keeping a journal of things learned is useful on so many levels. Children learn to distill large amounts of information into a single page and they can admire their progress by looking back at previous entries. I've been working with Stephen to keep a journal of books from the library. He draws a picture and copies the title or writes a few words to describe what he's drawn. Then, I ask him to tell me the story in a few sentences and I copy them onto the page. Eventually, he will be able to write more on his own. We also have a "STEM" journal for science and nature observations, though right now it's mostly filled with Stephen's drawings of various Wild Kratts episodes. Though I agreed with the above approaches, I did have some qualms. The book never convincingly explains why getting through college by 17 or 15 is so beneficial. One Amazon reviewer suggested the real aim was to skip from the innocence of childhood to the responsibility of adulthood while cutting out the potential rebellious phase of adolescence. I'm not quite so cynical, but I found the Harding's argument that it made sense financially (as college tuition costs are rising every year!) to be less than compelling. Why not allow children to pursue their passion at a more standard pace and help them to go to the best program for their field? As a writing tutor, I know that some college students write at a grade-school level. I feel that pushing children to a no-name college at a early age is not necessarily a testament to their academic prowess. Rather, it might reveal the weakness of the college. Will any college degree do for achieving one's dreams? Will all colleges offer the same quality of education? And what will a college grad do at age 15 when they are too young to be hired or even drive? Oh yeah: get a master's degree. The chapter written for those who aren't homeschooling begins encouragingly enough by saying that there are many things parents can do for their public or private schooled children. However, the list of practical suggestions is thin and quickly tilts toward suggesting that one should home school after all. I got the impression that the publisher required the Hardings to include this chapter to broaden the market for the book, and the authors obliged them by cobbling together some random thoughts to show that such a chapter doesn't belong in their book. Many times, the book feels like a platform for other purposes besides outlining the "Method." In particular, for promoting the Hardings' particular brand of quiver-full Christianity, for bragging about their fleeting moments of would-be stardom, and for promoting their phone consultation business and skiing website. It's their book, so they should be free to share their beliefs and promote themselves, but I felt that the addition of so many recommended resources (Harding Hip Hop Dance Party Playlist anyone?) really cluttered up the main idea of the book. Finally, I have a beef with the authorship of the book. Kip's name is listed first, but from what I can tell the book was mainly written by Mona Lisa and padded up with essays from the kids. Kip is the one working on a doctorate in education, so ideally, he'd be showing how educational theory supports or enriches this approach. Instead, Kip writes a "chapter" near the end of the book that's basically a sappy group thank you note to his wife and ten children. If you are home schooling and like watching the Duggars, you might enjoy reading this book for the stories Mona Lisa tells and to glean God-centered ideas for balancing the busyness that comes with educating a big family. However, I've pretty much summarized the main educational content of the book in the first section of this review. For that reason, I don’t really recommend buying this book, as I didn't feel it was really worth the $10 Kindle price. On the other hand, I often wag my finger at my husband for his purchases, so I might be biased. Perhaps I can get Joe to weigh in as well. Review of "Benefit of the Doubt"